In this paper, we present a review concerning the coupling of Geographical Information Systems with agent-based simulation. With the development of new technologies and huge geographical databases, the geographers now deal with complex interactive networks which describe the new Geopolitics and world-wide Economy. The aim here, is to implement some self-organization processes that can emerge from these complex systems. 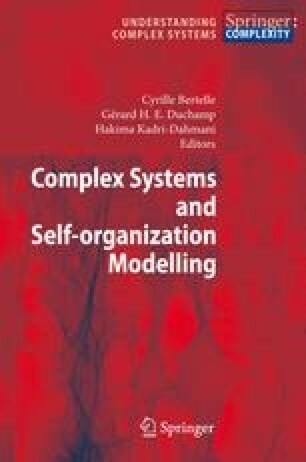 We explain how we can today model such phenomena and how we can implement them in a practical way, using the concept of complex systems modelling and some efficient tools associated to this concept. Agent Analyst web site (2008) http://www.institute.redlands.edu/agentanalyst/AgentAnalyst.html. Gessler, N. (2008) Building Complex Artificial Worlds. http://gessler.bol.ucla.edu/, http://www.sscnet.ucla.edu/geog/gessler/borland/segregation.htm. Repast web site (2008) http://repast.sourceforge.net.